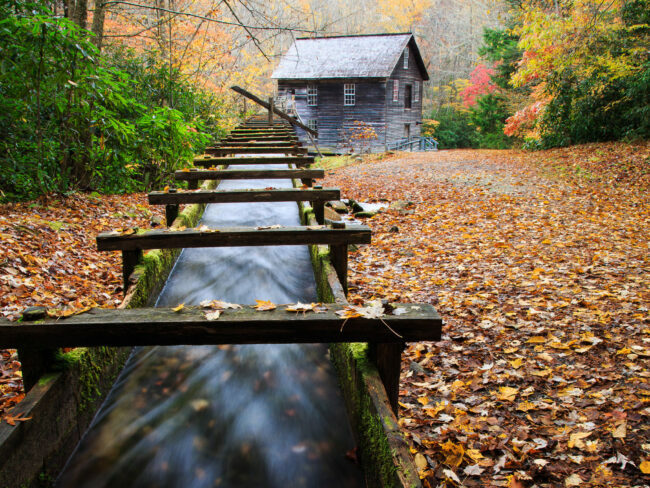 Directions: Mingus Mill is located in the Great Smoky Mountains National Park. From the Oconaluftee Visitor Center, drive north one half mile and turn left into the parking lot. The Great Smoky Mountain National Park was the most visited national park in the United States in 2014. One of the attractions amidst the 521,896 acres of the park is Mingus Mill. The mill can be photographed any time of year, but fall is particularly nice. Peak fall colors in the Great Smoky Mountains is usually between mid-October and early-November. You can check the park website for the fall color report. Also, visit on an overcast day for best results. Use a tripod and a shutter speed of about 1 second to blur the water in the millrace. Mingus Mill is a working mill, so you can also go inside, see how it works, and buy some cornmeal that was ground at the mill.